In the Image window the first task is to open Axial, Equatorial and Sagittal CT or MR planar reconstructions of the eye. These images are used to measure the diameter of the eye at the equator, to determine the distance between the posterior pole and the center of the optic disc, and to estimate the curvature of the anterior and posterior hemispheres. Next, CT or MR images for a meridian plane (T-Mer.) and a coronal plane (T-Cor.) that intersect the tumor apex are opened. These images assist in determining the location within the eye of the tumor, especially tumors that are too anterior to be photographed by the fundus camera. Planar isodose calculations can also be overlayed on these images. Next, one or two Ultrasound images are opened to document the tumor height and shape, such a dome or mushroom. A Fundus photo or collage of photos is then opened. The fundus photo collage is used to digitize the perimeter of the tumor base at the retina. Lastly, an optional frontal picture of the Eye may be opened. Suture guidance meridians can be projected onto this picture to assist the surgeon when marking the suture meridians. or simply drag and drop image files into the window using the MacOS Finder. If you drag a single image it will be loaded into the currently selected memory buffer. If you drag multiple images simultaneously they will be loaded into the memory buffer according to the PS image naming conventions. Many common image file formats are supported (e.g. JPG, PNG, TIFF, GIF). All images require a simple manual calibration procedure to determine the dimensions represented by an image pixel. The recommended software for preparing and exporting the multiplanar reconstructions (MPR) that PS expects is the OsiriX program. Try to keep images under 1000x1000 pixels, there really is nothing to be gained by larger images, and the file size of .pdf documents becomes too large to send by email. When you save a patient setup file, a copy of each image is stored in .png format within the .iplan6 package, so file size can become large if the images are large. Images can be magnified using the "zoom" buttons at the lower left of the window, and you can pan using the scroll bar controls or by holding down the command key and "dragging". Because Plaque Simulator imports images from many file formats, there is no practical way for the software to determine what kind of image it is opening other than having the user provide that information. The Axial, Equatorial, Sagittal, Tumor-Coronal, Tumor-Meridian, Ultrasound 1 & 2, Fundus and Eye buttons are linked to 9 offscreen image memory buffers that have been prepared for each type of image. You can open any kind of image into any of the memory buffers without damaging the program, but the results from a treatment planning perspective will be undefined. The process is straightforward. For example, to load an axial reconstruction, select the axial image memory buffer by clicking the Axial button. PS will display the axial image if one has already been opened, or an empty window if the axial buffer is empty. To load an axial image, control-click the Axial button using the mouse (or trackpad) and keyboard or the functionally equivalent right mouse button and select Load Axial... from the contextual menu. This menu item launches a MacOS Finder navigaton services window from which you can navigate to and open the desired image file. You may also simply drag and drop an image file into the PS Image window from the MacOS Finder. Repeat this process for the other images. When opening a single image file, the file's name is ignored. Shortcuts: If all of the images to be opened adhere to the PS file naming conventions you may simultaneously drag and drop a selection of images (up to 9 images), or, if the files are located in the same folder, the folder that contains the images onto the Image window. You may also option-click any image selection button or select Load All... from any button's contextual menu and use MacOS navigation services to open a group of images simultaneously. These links detail the file and calibration procedures for CT & MR images, fundus images and ultrasound images. Note: The most efficient method of managing images is to follow the image naming protocol, organize all of the images associated with a patient into a folder named for the patient, and then simply drag and drop that patient folder onto the image window. If the treatment plan's patient name is currently empty, PS6 proposes a patient name derived from the parent folder within which the images are located. In PS version 6.3.3 a preference setting was added to the user preference pane which enables also automatically attempting to choose an institutional team preset when opening multiple images, e.g. by drag and drop. A team preset is proposed by comparing the name of the grandparent folder of the images to the list of institutional team preset keys. To use this new feature most effectively, adopt a protocol in which you use the same name for your institutional team preset keys as the institutional folders into which you organize your patients. For example, organize all patient folders for institution "USC" into a folder named "USC", and then create a team preset with key "USC". When interpreting parent and grandparent folder names and preset keys, any portion of a folder name or preset key, including and enclosed within () characters and any leading and trailing whitespace will be ignored. For example, "File Name (other info)" will be interpreted as "File Name". Plaque Simulator supports two methods of image tonal adjustment: (1) Brightness & Contrast (BC), and (2) Gamma, which has controls for Bias, Gain and Level. In Gamma mode, slightly decreasing Gain and shifting Level is often very effective for enhancing scleral contrast in a CT image. Gamma (vs Brightness & Contrast) - Toggles between the BC and Gamma methods of tonal adjustment. Bias/Brightness - Turn knob CW to increase the Bias or Brightness, CCW to decrease. Gain/Contrast - Turn knob CW to increase the Gain or Contrast, CCW to decrease. Level - Turn knob CW to shift the Gamma Level setting to the right towards white, CCW to shift left towards black. Reset - Resets the image tonal controls to their default settings. Left & Right - Select between modeling a left or right eye. The buttons in the MPR group are intended to select and calibrate multiplanar reconstructions such as CT and/or MR images. When an image has been loaded into an offscreen buffer, the button for that buffer will display a small, dark gray badge to the upper right of the button icon and the Ruler, Angle and Calibrate buttons become functional and may be optionally enabled. Axial - Displays the axial image. Equator - Displays the equatorial image. Sagittal - Displays the sagittal image. T-Cor. - Displays the coronal image that intersects the tumor apex. Use OSIRIX to create this image. T-Mer. - Displays the meridian image that intersects the tumor apex. Use OSIRIX to create this image. Ruler - Enables display of the MPR calibration tool for the selected image. Adjust the diameter of the circle to a known distance in the image such as 40 or 50 mm. This button's contextual menu provides access to a customizable properties sheet for that image's rulers and a slider to adjust the control handle size. Angle - Modifies the ruler calibration tool to display additional distance and angular measurements. Calibrate - Opens the image calibration sheet in which is entered the diameter of the primary ruler calibration tool in mm. US 1 - Displays ultrasound image #1. US 2 - Displays ultrasound image #2. Ruler - Enables display of the ultrasound calibration ruler tool. Adjust the diameter of the circle to a measured distance in the image such as the tumor base or height. You can customize the appearance and control handle size from this button's contextual menu. Calibrate - Opens the ultrasound image calibration dialog in which is entered the diameter of the ruler tool in mm. Fundus - Displays the fundus collage image. Eye - Displays the eye picture. Ruler - Enables display of the fundus calibration or the eye picture meridian compass tool. Place the pole labeled end of the fundus calibration tool over the posterior pole, the other end over the center of the optic disc. For fundus collages, drag the collage center markers to the center of each collage component. For eye pictures, drag and size the meridian compass to fit the limbus. You can customize ruler appearance and control handle size from the ruler button's contextual menu. Calib. - Opens the fundus ruler calibration sheet in which is entered the distance between the disc and pole in mm. This distance is automatically calculated by the eye sizing tool. From this dialog you can also remove the background from the collage (typically black or white) by assigning a transparency color. Note: the eye picture ruler does not require calibration because it only displays meridian plane angles. Angle - Modifies the fundus calibration or eye compass ruler to display the meridian angle compass. The compass markings may optionally be configured to display clock hours or toric axis angles using items located in the contextual menu of the ruler button. Collage centers - Select the number of pictures that were stitched together to make the collage. Collage slider - Optionally adjust the diameter of the collage picture range tool. Miscellaneous pictures are provided for documentation purposes only, they can not be calibrated or used in any quantitative way in the plan. They may, however, be printed on page 4 of the treatment plan via document preference settings. 1 - Displays miscellaneous picture #1. 2 - Displays miscellaneous picture #2. 3 - Displays miscellaneous picture #3. Eye - Enables display of the eye sizing tool on MPR and ultrasound images. You can customize the tool control handle size from this button's contextual menu. 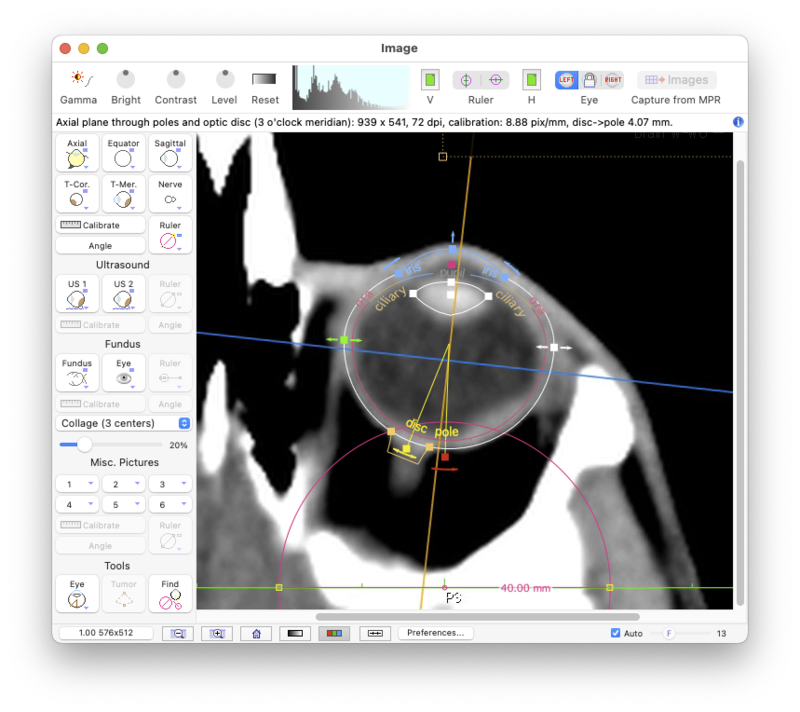 Tumor - Enables display of the tumor angle and height tool on the T-Mer. image. With this tool you can drag the tumor base (dark brown) control handle along the inner scleral surface to mark the approximate location of the tumor as it appears in the T-Mer. image. This location is saved as the T-Mer. tumor angle, an angle in the meridian plane between vectors originating at the eye origin and pointing towards the tumor base and the posterior pole. The T-Mer. tumor angle is displayed in the Eye Size window. The T-Mer. tumor angle is only used to help PS decide which direction to rotate the meridian dosimetry plane about the AP axis when auto-centering the plane, it does not reposition the tumor. The tumor tool is best used only after the tumor base position has been finalized. 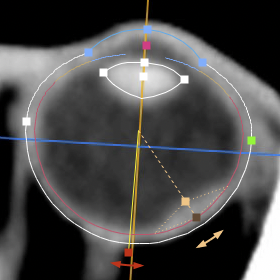 Note: the beige colored apex control handle of the tumor tool does change the tumor height, but it is limited to the vector pointing from the tumor base towards the eye origin. If the tumor is not symmetric about this vector, set the tumor apex from the Retinal Diagram window. In general, the tumor height is best set manually based on ultrasound imaging. Find - Brings offscreen tools back into view. Halves the screen size of an image pixel. Doubles the screen size of an image pixel. Displays the image as 1 screen pixel per image pixel. Displays image in 8 bit monochrome (256 shades of gray) mode. Displays image in 32 bit color mode.